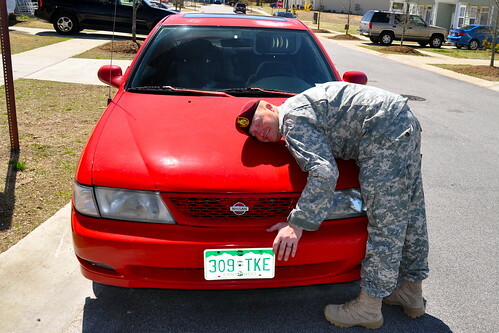 Albaeck (After) Army Adventure: goodbye sweet car! I got the Nissan 200SX (partly) as a high school graduation gift from my parents (early) in March 2000. Over the past decade she has been involved in all of the important aspects of my (our) life. I had her for high school graduation, my move to Colorado for school, moving back to Arizona, and getting married, which is when she became joint property with Jacob. She was the car that we brought Christopher home from the hospital in. Once we added a second car (mine) into the mix, the Nissan became Jacob's car exclusively and has been for the past five years. She got him to work everyday and accompanied us on our move back to Colorado and then later, out to North Carolina. She's been a great little car for almost 150,000 miles but it was time to say goodbye. 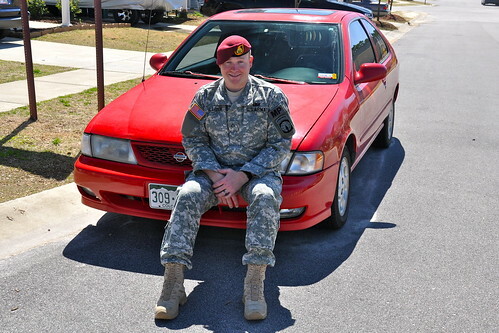 We sold her to CarMax this afternoon and now we're a one-car family until Jacob deploys. Awww... she was a good car... and will be for someone else now.